Anderson Fuel is your total home-cooling solution. Whether you’re planning new construction, remodeling, updating equipment, or simply looking to improve the comfort in one area of your home, we can help. We’ll come to your home, evaluate your needs, and provide a free estimate to match your goals and budget. Each year we install more than 50 new and updated cooling systems. For large projects, we look at everything from architecture, existing distribution options, and airflow, to proper sizing and balance of condenser coil and air handler. Whether you own a historical home or are planning a new build, we can spot and resolve challenges that others may miss. 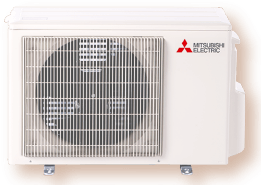 For smaller needs, we can adapt new technologies to existing equipment—such as updating individual unit/coils based on new and improved refrigerant blends—or we can recommend one of the new ductless / minisplit systems capable of both heating and cooling. No matter what size your project, our expertise with a range of cooling systems and manufacturers gives us the ability to deliver a solution perfectly matching your needs. We provide full installation and service, and offer a range of monitoring and control technologies for today’s modern home. One of the biggest names in energy- efficient home comfort with time-tested energy-efficient technology, highly durable materials and spot-on manufacturing. So, no matter where you live or whether your home is small or large, Goodman has a solution to help keep your home comfortable. Features multi-position installation, all-aluminum evaporator coil, Improved humidity and comfort control, variable-speed motors, available field-installed electric heat, and Smartframe™ substructure. Can be configured horizontally or vertically to ensure fit wherever used. Can easily be installed above ceilings or in crawl-spaces, closets, basements, or the attic. The modular layout lets you choose the right options for your project. A unique cooling option for Williamson Furnace Thermoflo Products. R-410A refrigerant compatible with high efficiency enhanced aluminum fins bonded to riffled copper tubing, aluminum end plates, pressured tested to 450 lbs, with insulated cabinet. A truly flexible system delivering cooling only or cooling / heating combined. Whether you have a single uncomfortable room, you’re renovating your entire house, or you’re building a new home, the Zoned Comfort Solution® fits a range of unique needs. These systems focus on individual living spaces rather than treating every room the same, making it more customizable, more energy efficient, and easy to install.